Army Sgt. 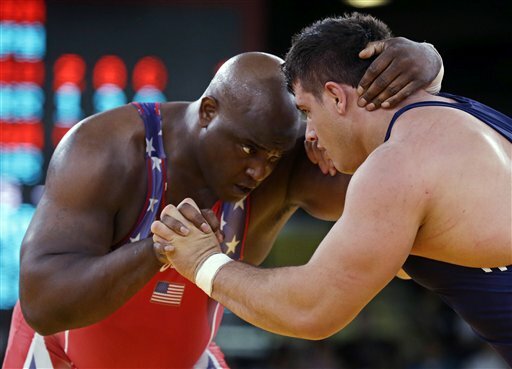 1st Class Dremiel Byers, left, battles Turkey’s Riza Kayaalp in 120-kilogram Greco-Roman Olympic wrestling action Monday in London. Kayaalp’s narrow win, and his loss in the next round, knocked Byers out of medal contention. Two Army sergeants first class came up short of the Olympic podium in London on Monday — one on the wrestling mat, the other on the shooting range. Sgt. 1st Class Dremiel Byers, making his second trip to the Olympics, was knocked out in the quarterfinal round of the 120-kilogram Greco-Roman bracket, falling 1-0, 1-0 to Turkey’s Riza Kayaalp. Kayaalp went on to lose in the semifinals, which eliminated Byers from bronze medal consideration. It’s the second Olympic trip for Byers, who also reached the quarterfinals in Beijing. He won two matches in China to reach the round of eight, but in London he needed just one — a 1-0, 2-0 win over Uzbekistan’s Muminjon Abdullaev. Byers is the second soldier to come home empty from his time on the London mats, with 55-kg Greco-Roman wrestler Sgt. Spenser Mango falling Sunday. Mango won his first match before losing to the silver and bronze medalists; here’s a full Army report. Spc. Justin Lester gets his chance at Olympic glory Tuesday in the 66-kg class. Meanwhile, at the Royal Artillery Barracks, Sgt. 1st Class Jason Parker, competing in his fourth Olympics, finished 30th in the qualifying round of the men’s 50-meter three-position rifle event, with only the top eight reaching the medal round. Among those eight was Parker’s countryman Matt Emmons, who ended up with a bronze medal on the last day of Olympic shooting.